I'm trying to debug the Android part of my app, which was working fine yesterday, but since loading the project up today has stopped working. The output window displays these messages. 06-28 14:36:25.452 F/monodroid(32075): cannot find libmonosgen-2.0.so in override_dir: /data/user/0/com.companyname.CrossPlatformApp/files/.override, app_libdir: /data/app/com.companyname.CrossPlatformApp-1/lib/arm nor in previously printed locations. 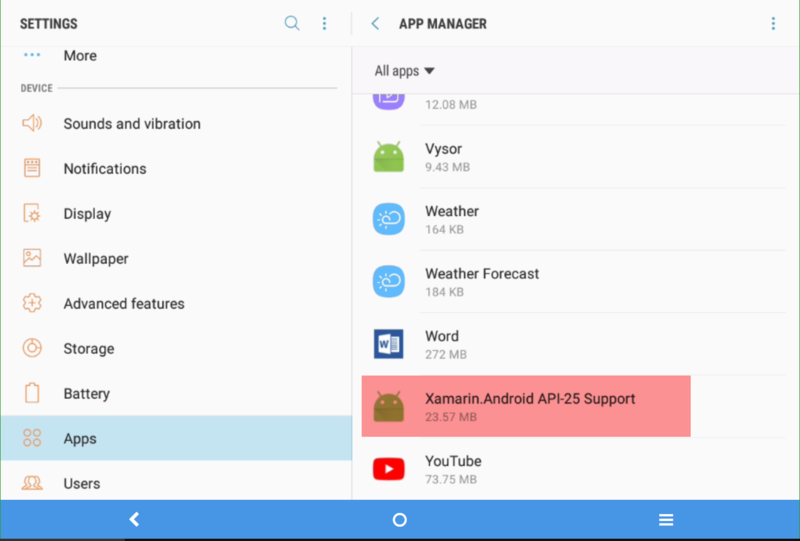 06-28 14:36:25.452 F/monodroid(32075): Do you have a shared runtime build of your app with AndroidManifest.xml android:minSdkVersion < 10 while running on a 64-bit Android 5.0 target? This combination is not supported. 06-28 14:36:25.452 F/monodroid(32075): Please either set android:minSdkVersion >= 10 or use a build without the shared runtime (like default Release configuration). I have tried cleaning and rebuilding the project, but this hasn't worked. Any ideas what's happened/how to fix it? What exactly do you mean by "stopped working"? It deploys but doesn't debug? The debug sessions starts and then your app crashes right away and returns back? @ClintStLaurent the device briefly displays a white screen (the background colour of my start up page) but doesn't get as far as loading the controls, before then just returning to whatever screen my device was on before loading the app - usually just the home page. I'll give those suggestions a whirl and see if it fixes it. Also, @ClintStLaurent where do I find the mono runtime and the Xamarin.Android.Support libraries? Really? You haven't set the name or company or any of the info for your app? How many other projects do you have on the tablet that are also unset and therefor running with the same identity? So it is debugging. Debugging has not stopped working. Your app is crashing shortly after launch. So you've got a problem with your code crashing the app. You're going to have to debug like any problem. Personally I'd suggest start with walking through the execution (F-10), or putting console.writeline statements at the start of each phase of startup to see how far it gets. @ClintStLaurent this is my first Xamarin app, so I'm just playing around getting used to how it works and creating a basic test app - that's why I've not set the name or any information.